“I am a site-specific artist, writer, curator and archaeologist who combines academic enquiry with artistic philosophy. My work transects the boundaries between art and science, it is a philosophy that draws upon phenomenology as a theoretical and methodological tool and is engaged with sensory response to and perception of place and elements. Much of my work is informed by the act of walking, cartography and topography as well as the element of water. It is also concerned with the environment and the interplay between nature and culture. I came to Joya AiR with four sketchbooks of varying size and style, charcoal, sketching pens and camera with no other expectation other than knowing that what I would create would be about these parameters of my work and, more specifically, about place”. “What followed was a two week immersion into the landscape, daily walks, drawing and writing. I became attuned to the topography of the land, its hill profiles and the shape of the valley of La Hoya de Carrascal. I climbed the high points of Sierra Larga and Las Almohallas and frequently traversed the low-lying barranco, the Rambla de Cajar. Walking, according to the writer Rebecca Solnit, is how the body ‘measures itself against the earth’, while the anthropolost Tim Ingold suggests that landscape can enter into our ‘muscular consciousness’. This form walking is what I call an embodied cartography, a method in which the body perceives and understands place. As time passed and my connections to the landscape became more nuanced, I started to shape my movements according to the sensual characteristics of the winds of the Sirocco and the Levante (also known as the Solano). In the evenings, I would tilt my sight upwards and watch the lágrimas de San Lorenzo, the Perseid meteors dart across the clear, star illuminated sky whilst listening to the acoustic resonance of two scops owls calling from deep within the landscape. As much as my body recalled place, so the landscape recalled my presence in it. I encountered my perfectly preserved footprints along obscure routes that I had walked in previous days. I sat on boulders that remained clear of dust and debris from when I first positioned myself there and I navigated my way by visually wayfinding the particular characteristics of hill shapes and topographic features. I walked with a goat, who showed me pathways along mountain ridges and guided me through routes out of deep crevices and dense forests. And, as a walked, I became increasingly aware of being in an ancient landscape where others have been before me and of water and the environmental, social and cultural importance of it. I recalled Simon showing me the ancient hydrology system that is still visible in the landscape, I spent time with an alder tree that grows where a relic water source once flourished and I repeatedly walked a complex dry fluvial system, a negative space carved into the land and shaped by the action of moving water. Cortijada Los Gazquez (home of Joya: AiR) lies at a confluence of elements, time and space filling the night sky and shaping the contours of the land. It has many topographical stories to tell”. “Joya: AiR / Joya: arte + ecología, is a truly international programme. During my residency I had the great pleasure of working alongside incredible artists from Argentina, The Netherlands, Portugal, America and the UK. There is something rather profound in creating an environment in which people come together to work and have space to think and create. We gathered in the evening over dinner, sharing stories, talking about our work and enjoying nourishing times of collegial creative conversations. What Simon and Donna have created, along with their twins Soli and Sesi (and during my residency the wonderful volunteer and artist Gwenda Jakobs), is a remarkable setting and a unique and immensely rewarding experience for artists”. Stevens, F. 2008. Elemental Interplay: the production, circulation and deposition of Bronze Age metalwork in Britain and Ireland. World Archaeology 40/2, 238-252. “On my first day at Joya: AiR I wrote in my notebook ‘You have all the time in the world Zoe’. I often experienced time differently at Joya – it felt eternal. And as I draft this at the airport leaving Spain, desperately trying to capture the last essence of my residency experience, I realise soon it will exist only as memories, documents and images. However, I believe this collection of thoughts and ideas will have longevity. I came to Joya with the intention of utilising the abundance of sunlight to produce photopolymer plates. Though such experiments were undertaken, as was inevitable other investigations and production took place. I have an on-going project whereby I collect news headlines and re-create these using various media/technology. I have a particular collection that I return to often. They have previously existed in various incarnations – as letterpress prints and digital projections. I found myself drawn to these yet again during the residency and created these as photopolymer plates (to be printed on my return to the UK). I collected ‘new’ current news headlines during my time at Joya. They have now become a part of this on-going project and have been subsumed into my collection. It will be interesting to see what they signify in a week, month, and year. The physical newspaper also became a material for me during the residency as I began to experiment with cutting up and collaging news images and using the studio window as a way to experiment with the transparent nature of the paper. In addition, I also created Cyan prints of various plants and objects that existed in the landscape and environment around Joya. I was interested in the layers of history that inhabit the space and the stories these objects reveal. The positive experience will certainly influence the ‘personal’ headlines I intend to create as a document of my residency period”. 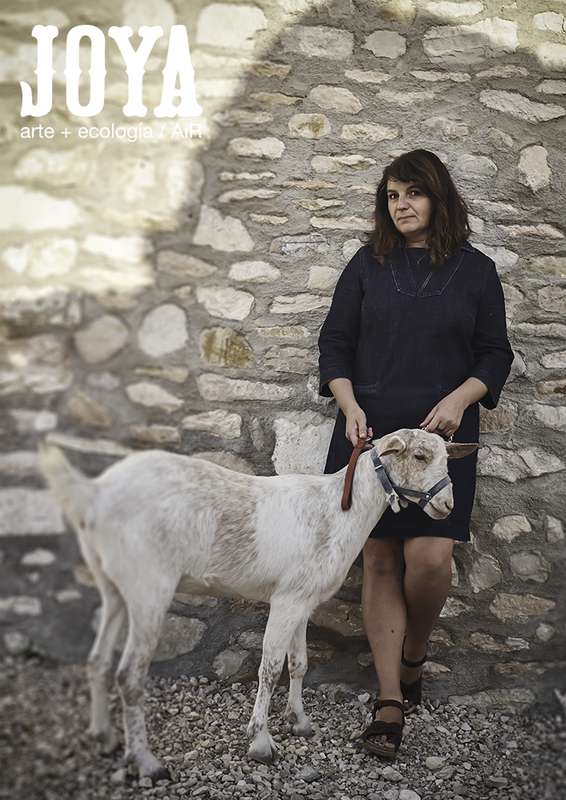 Anna Macleod is an October artist in residence and collaborator with Joya: arte + ecología. Anna is a visual artist and independent researcher based in rural Northwest Ireland. She is a former lecturer in Fine Art Media and Programme Chair of the Fine Art Programme at the Dublin Institute of Technology. ‘My work uses quasi-scientific methods, trans-disciplinary collaboration, performance and activism to critique contemporary landscapes and re-vision the future. I am interested in the potential of art to bring about social and environmental change. Recent projects have focused on the socio-political and cultural issues surrounding water, looking at local and global questions of access, management, control and consumption of this finite substance. Careful monitoring of the system will, over the period of a year, give some data as to the effectiveness of the sculptures in both gathering atmospheric vapour and channelling rainfall to the terrace / swale system under construction at Cortijada Los Gázquez the home of Joya: arte + ecología. We will be updating progress of Anna’s residency and progress over the coming month. It feels difficult to report the experience I had in the residency at Joya: arte + ecología. Although it was an insightful one, which nurtured me a lot, it seems I am still digesting it. Perhaps that is because somehow it has not finished yet, once its outputs are still in progress. Before arriving at Cortijada Los Gázquez at Parque Natural Sierra María-Los Vélez I only had a vague idea of the dynamic of the place and of how my project would be developed over there. Aware that I would only find it out in situ, I tried to prepare myself as much as I could. In my suitcase I was bringing a couple of books, my equipment and some objects that I imagined to make work with. Arriving in Granada, though, I have been told that my luggage was lost and that the airline company could not guarantee the exact delivery date. Spending the first week with only few clothes and part of the equipment would have been an unfortunate beginning, unless it did not allow me a deeper exchange with the place I was inserted in. As Rauschenberg said, “when you are lost you look so much harder”. My initial project was based on an ambiguous sensation of missing the natural environment from my home country, which had been strong since I moved to London one year ago. The nostalgia of having a lifestyle in Brazil, which was more integrated with nature than I have been able to do recently, was combined with an anger provoked by facts regarding the huge devastation there. I was particularly struck by the recent disaster caused by the collapse of a mining dam in a Minas Gerais, which created an enormous environmental impact. The strong image of the mud invading villages, rivers and the sea was attached to my memory about Brazil and generated the need to produce a work of that. In this residency, I wanted to approach this double relation to the environment, between a certain healing that nature can promote and the environmental disaster. Inspired by De Maria’s manifesto On the Importance of Natural Disasters, in which he states that natural catastrophes ‘may be the highest form of art possible to experience’, I was interested in this same force that can be both generative and destructive – whether producing an artwork or a disaster. Intending to avoid making a spectacle out of the images of the disaster in Minas Gerais, my initial proposition was to try and create experiments using the sound of the explosion plus sounds that would be recorded during the residency. Although I was interested in that Brazilian landscape, after my arrival in Andalucía it became clear that it would be more sincere to react to this place rather than evoking something that was not present. The lack of the specific material I was planning to use also pushed me to detach from my previous plans and to throw myself to the experience of the place itself. Yet the landscape in Sierra de María-Los Vélez Natural Park is astonishingly beautiful, it has been suffering from centuries of human unsustainable occupation plus the consequences of climate change. The agricultural practices, such as monoculture farming, as well as the arid climate and lack of rains have been causing a severe process of desertification. Amid that area, though, Cortijada Los Gázquez is a pole of renovation. Restored from an abandoned complex of five dwellings, the residence is constituted by bright and generous spaces, designed in resonance with local architectural tradition. The off-grid energy system makes use of the abundant sunlight and wind that characterise the site. Inside the house, the loving family members Donna, Simon, Sesame and Solomon make the artists-in-residency feel like home. ‘I don’t necessarily desire a perfect photography’. Interview by Alain Sayag (1981), in Robert Rauschenberg Photographs, Pantheon Books, New York. My practice as an artist is mostly based on research and perception of territories. Having a camera, an audio recorder and my body as main tools, I work across different media, including film, performance and installation. For the development of a new work, I would describe my research method as similar to Suely Rolnik’s definition of the cartographer’s practice. In her words, ‘the cartographer does not intend to explain or reveal. What they want is to dive into the geography of affects and to invent bridges of language to make their crossing. (My translation). Rolnik, S. (1989) Cartografia Sentimental: Transformações contemporâneas do desejo. São Paulo: Editora Estação Liberdade. I spent a fortnight in the company of the Beckmann family at El Cortijada de Los Gázquez (home of Joya: arte + ecología), in an alpine desert, living at 1000m above sea level in the Parque Natural Sierra María – Los Vélez. In the spring of 2016, I applied to the Art for the Environment International Residency Programme (AER) run by Professor Lucy Orta at the University of the Arts London. The award was for a number of research-led artist residencies to take place across the world for existing and recently graduated UAL students. I was about half way into my first year of a PhD programme at London College of Communication, studying within Creative Research into Sound Art Practice (CRiSAP) research centre. What struck me about the opportunity to visit Los Gázquez was the idea of spending two weeks off-grid. Two weeks without. Two weeks disconnected. What might two weeks offline do for me? To me? What did off-grid mean? What kind of systems would be in place to live an off-grid sustainable life with a family (two adults, two children in a non-native country). I was also interested in studying the environment of Los Gázquez as an off grid site. Far from any built up metropolitan centre, far from where I tend to spend most of my life, in the anthropogenic urban wash of cars, generators, ambulance sirens and helicopters, impossible to distinguish one source of noise from the next. I wondered what a rural and open landscape might offer as an alternative field to my listening and recording practice. My application for the residency was based around some of my PhD research questions. My research is based around what I call ‘sonospheric investigations’ into media infrastructures. That is to say, that I try and listen to a whole gamut of frequencies, using air-borne and land-borne transducers, converting vibrations into digital signals that can then be converted into sound from loudspeakers. I centre this listening practice around the internal and external architecture of media infrastructures (data centres, fibre optic cable landing sites, satellite and telecommunication receivers etc). I am interested in how the Internet and its related infrastructures vibrate across the globe as a physical material network; the ‘medianatures’ of the Internet, to paraphrase Jussi Parikka. At Los Gázquez, I wanted to experience being disconnected from the internet but I also wanted to study the infrastructure of an off grid site. Data Centres in particular are the hub for the global Internet network and as such are huge consumers of energy. Many of the world’s biggest companies operate them (Apple, Google, Facebook, Amazon, Microsoft etc). They are a huge burden to the electrical grid of their surrounding area; it is estimated that they use an equivalent energy requirement to that of the aviation industry and as such, they are a significant site for ecological, socio-political and environmental concern, as well as a significant site of property rights, concepts of the self, the posthuman, the cyborg, the Anthropocene and of provenance and rights in the digital age. My research led me to analyse the noise of such sites as representative of waste. The noise, generally being vibrations caused by industrial scale HVAC systems, fanning hot exhaust air into often cold climates (in the northern regions of Scandinavia for example). Recently, I have been studying a site that Apple have been in protracted negotiations for over a year to build a data centre in. It is in the Derrydonnell forest in County Galway, Ireland, close to the small but well known medieval town of Athenry. Apple claim they will use exclusively 100% wind energy from the grid. I was confused but fascinated at such a claim given how estimates are that the data centre once fully operational is expected to require around 8% of the entire Irish grid’s energy allocation (more than the capital city Dublin). And so I began to wonder what exactly does sustainability mean? What does sustainable energy mean? How sustainable is the technology used that is claimed to be ‘zero carbon’? Surely it is made full of components built as a result of intensive land destruction and mining; the production of rare earth minerals and metals for example to produce microchips, lithium-ion and lead batteries. I am not interested in becoming a Luddite and thankfully neither are the Beckmann’s at Los Gázquez. They are interested in doing the best they can to maintain a good quality of life in as off-grid and sustainable way as they possibly can, investigating the possibilities of land reclamation, and returning to sustainable measures of living without burying their heads in the sand and without harking back to some kind of golden age that never existed. They are progressive and thoughtful about how they can make a positive and ecologically sensitive impact on Los Gázquez. I spent most of my days field recording and creating a library of sounds, produced according to my own initial intrigue and then later, according to the sounds that the residents here associate with living in Los Gázquez. The library comprises goats, crickets, sheep, vultures, wind turbines, water pumps, photovoltaic panels, clay fizzing with water, children playing games, people eating dinner, flip flops across the concrete floor, diesel generators, a Land Rover, the silence on top of a mountain, electromagnetic noise from battery stores, electromagnetic interference from a phone attempting to connect to a distant and patchy 4G signal, helicopters, jumbo jets and much more. The collection of recordings put the environment at the centre of my thinking but I am thinking of the environment as the things that surround us as we exist. This is not a study of nature versus culture. For me the urban dweller, Los Gázquez and the surrounding area feels remote but the family home has electricity, Wi-Fi from a satellite uplink that connects to a suborbital network and bounces back to an exchange in Italy, and the landscape surrounding la Cortijada de Los Gázquez has signs of anthropogenic activity everywhere, from the terraced abandoned farm land to the water catchment systems, to the artificial walls and tributaries built within the Barrancos (water drainage, fluvial systems drawing down from the mountainside). I have been on many walks into the relative ‘wilderness’ of the Parque Natural Sierra María on my own, taking a bearing and just going for it. Listening carefully to changes in sound, the flies, the trees, the wind, the nothingness, the everything-ness. I have recorded infrasonic vibrations with geophones, contact transducer microphones on vibrating bodies of metal, stereo microphone recordings of my position in the landscape and electromagnetic frequencies with coil-tap transducers. I’m not sure what to do with this collection other than listen to it and think about how it might relate to my other work on the urban and black site data centre spaces of my existing research. How does a site like this challenge my conceptions of isolation, off grid? How many miles do I need to travel in Ireland to locate somewhere away from any kind of anthropogenic noise like I can here… Let alone London? Being disconnected from the internet… How I tried… How temptation pulled me back in… How on my fourth day, whilst marching up a mountain first thing in the morning, on my own, where I managed to see a fox, two vultures and an Ibex in their natural habitats, I became more intrigued by suddenly picking up a full strength 4G signal. How whilst thinking about life in a post-apocalyptic world, where petrol had gone stale, the grid was disconnected and the internet was just a myth, my field recorder started bleeping to the interference of a roaming mobile data signal and a sudden emergence of a low flying helicopter passed over me. How, even at my most isolated, I was never far away from signs of human activity, whether it be signs from the past 30-40 years or in the past 300-400 years. The marks were everywhere. It has been an absolutely incredible experience. I look forward to working through my recordings and thoughts, and the journal that I have been keeping which I will publish on my website at www.earthkeptwarm.com over the coming weeks, with processed recordings, pictures and videos. A log of work in progress, a diary of thoughts, and a documentation of research activity in this dry, barren and utterly beautiful landscape. I would like to extend my thanks to my hosts, Donna, Simon, Sesame and Solomon for being so welcoming. Their life here, as English expats, who have stepped up to a fascinating and difficult challenge of living in a radical and rural setting just north of the small town of Vélez-Blanco is truly inspirational. My thanks also go to the fellow artists and guests who have been here during my stay, Dayna, Elena, Melissa, Nana, Nigel, Anna, Peter and a special thanks to Abbie who without her… I wouldn’t have got completely lost one day when failing to find an ancient cave painting that was allegedly in plain sight. Mandel, Emily St. John. (2015). Station Eleven. Picador, Pan Macmillan, London, UK. Parikka, Jussi. (2015). A Geology of Media. Minnesota University Press, Minnesota, US.